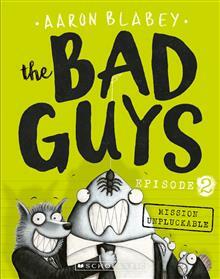 The Bad Guys are back with a daring plan to rescue 10,000 chickens from a high-security cage farm! But how do you rescue chickens when one of you is known as The Chicken Swallower? Join them as they return for more dodgy good deeds with a new member of the team. And watch out for... read full description below. 10,000 chickens are trapped in a high-tech cage farm! Who could possibly save them? Well, how about a WOLF, a SHARK, a PIRANHA and a SNAKE...who's also known as 'The Chicken Swallower'? What could possible go wrong? Get ready to laugh up your lunch as the baddest bunch of do-gooders in town get up to even more funny business! It's time for the Bad Guys Episode 2!